I mentioned this book briefly in my Around the Traps post about quilting the other week but it deserved further attention. Gee's Bend: The Architecture of a Quilt, has been on my dining room table for over two weeks now, and I can't stop looking at it. At breakfast. At lunch. When I'm having a cuppa. And I know this is a big call but I want to say that this is by far the best craft book I have ever purchased. No matter what type of crafter you are - you will find inspiration in here. I'm going to let my (slightly dodgy) pictures do the talking but I think but I need to say that these pictures do not do the quilts justice. There is a subtlety to the fabric choices and colour and wear is just incredible, and which you can only see by looking at the real images. And that these are only a small smattering of what is in there (I haven't even included my favourite). 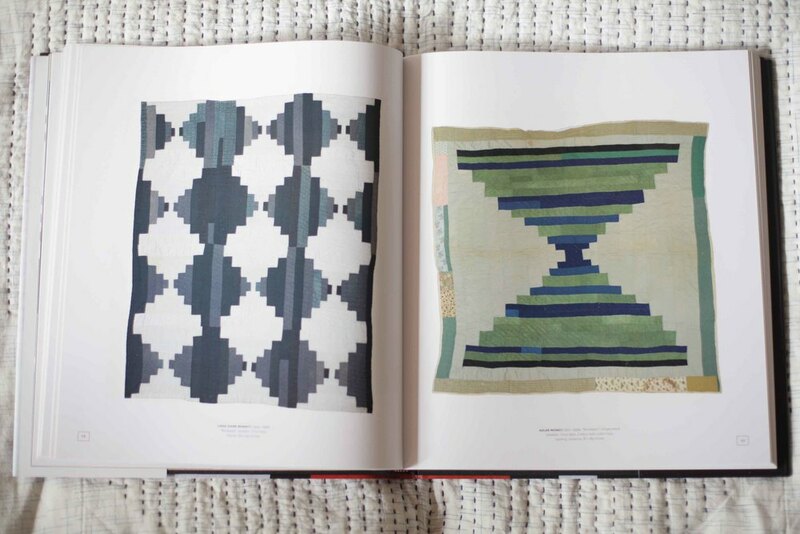 AND then there are the stories about the quilts and about the lives of the women who made them ,which just makes the whole book so much richer. I am totally in love and know this book will inspire me for many years to come. You can buy it from the usual places and you should. Or if you are joining me for #stash_less then I'd suggest you ask for it for Christmas ;)! I'd love to hear your comments if you have it or have seen it or would like to see it. Part 3 - I was totally wrong about patchwork! This is the third installment in this little mini-series and probably the last. (If you haven't read Part 1 and Part 2 you might want to backtrack as I describe just how wrong I've been and why). In this one we tackle the thing I’ve found the trickiest to love - that is the use of lots of printed fabrics in quilts. But again, over the last few years I have found more and more examples of quilts I love, that have this characteristic. There are beautiful examples of this kind of patchwork all over the place if you just start looking…. This style of patchwork involves the cutting up of a beautiful print and putting it next to another beautiful print – sometimes in a traditional pattern and sometimes not. And the thing that I have found tricky about it in the past, is the sense of overwhelm I feel. Sometimes it feels visually a bit too much – but I think that was because I was looking at the wrong quilts. Done right this can bring so much life and depth to a quilt. So I thought I would show you just a few examples to demonstrate how mixing printed fabrics can be done in a way that is thoughtful, considered and ultimately stunning. I haven't had quite enough time to gather all the permissions I wanted to to use other people photos so this post is a little link heavy. Still I hope that you enjoy the assortment of quilts I have pulled together that yet again demonstrate how wrong I was about patchwork! First up – those of you that have followed The Craft Sessions over the last year will probably realize that I have a little crush on Naomi Ito’s Nani Iro fabrics. Little is possibly an understatement. I have just a small pile which I occasionally dive into when I’m feeling brave. And that is how I came across today’s first quilt. I was looking for things to do with double gauze. I wanted to see how it would work best – a garment or a quilt. I remember seeing this quilt for the first time and thinking “wow!! that is clever”. And it is. It is the use of the print to enhance the simple design. It is the fact that there is quiet in the quilt. It is the simplicity of it – the use of a traditional pattern in a simple way using beautiful fabrics to make something stunning. And then after a little digging I discovered that the quilter is Australian Siobhan Rogers of Beaspokequilts. Her work has been featured in magazine after magazine and she seems to just have an incredible output. You can find more of her gorgeous work at her blog or her instagram. This simple traditional square cross quilt comes from Leslie who we will talk about some more below. And I wanted to include it because I love the simplicity of it. Image used courtesy of Leslie Keating. Click this link for another gorgeous quilt that is simply a collection of squares by Alessandria Taccia. And click here for a beautiful, more complicated star quilt that is so very pretty. 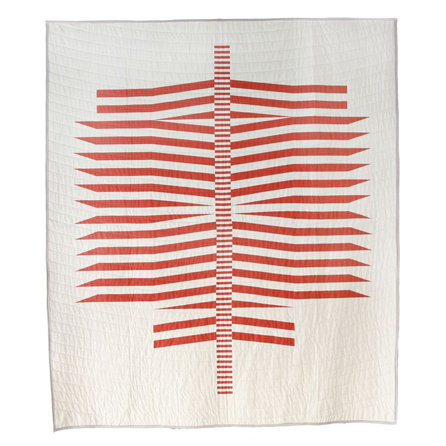 And then this stellar quilt by Toshiko Jinzenji. It is crazy good. If you like the idea of Old School Traditional quilts but want something considered and modern then you can't go past the lovely Karyn of Make Something. Karyn runs a shop called The Workroom in Toronto and has consistently made quilt after amazing quilt for years. Watching her work over the last few years and the work of her teachers and students, has been a big part of my patchwork turnaround. So thanks Karyn! If you go back through her flickr pages or join her instagram you will find inspirational quilt after inspirational quilt after inspirational quilt. Next quilt style up is totally different in it’s style - freestyle quilting. The first example is by one of our awesome teachers Leslie Keating of Maze and Vale. Leslie designs and prints her own fabrics and then uses them in her improvised patchwork quilts. She taught this style of patchwork at last year’s event and had people raving about “freedom” and “joy” and …. Have a look at some photo’s here. Image used courtesy of Leslie Keating of Maze and Vale. I think the thing that really makes Leslie’s quilts quietly sing is that fact that her fabrics all have a similar tone to them. I love the use of different neutrals and the different basecloths. And then there is the style. 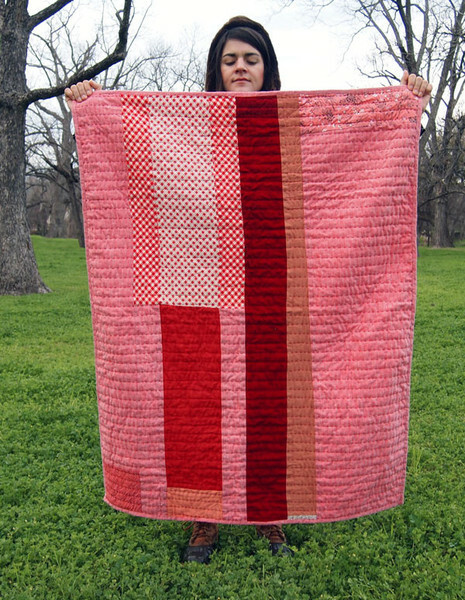 I love an improvised quilt – but it isn’t something I think I would feel free enough to do. Leslie's Improv technique achieves these random unplanned and stunning results. Photo of a quilt from The Craft Sessions 2013 class taught by Leslie. Another quilt that demonstrates this style beautifully is by the lovely Siri Hayes. Siri is my friend. She is an amazing artistic photographer but one of the benefits of being her friend means that I also get to see some of her amazing craft work. The woman is clever. And one place she always floors me is her use of colour. Siri took Leslie’s class last year and put together a beautiful quilt top that I was a little obsessed with. And then just before I left, I went for craft night at her house and saw another one she was putting together and it is just stunning. This is one of those times when someone’s inate (or learned?) understanding and use of colour is what makes the quilt top sing. I asked her to take some photos for me. They don’t do it justice –said with total love for the quilt as the photos are gorgeous. There is always a subtlety to what makes the colour in a particular work sing. Maybe it goes back to some of the points in my last post or maybe it doesn’t’? I still don’t feel I undertand this one enough. But I love watching other people achieve it. Still so much to learn. I also love this quilt again by Siobhan that she did in collaboration with the wonderful CLOTH fabrics. Gorgeous colours and use of prints. 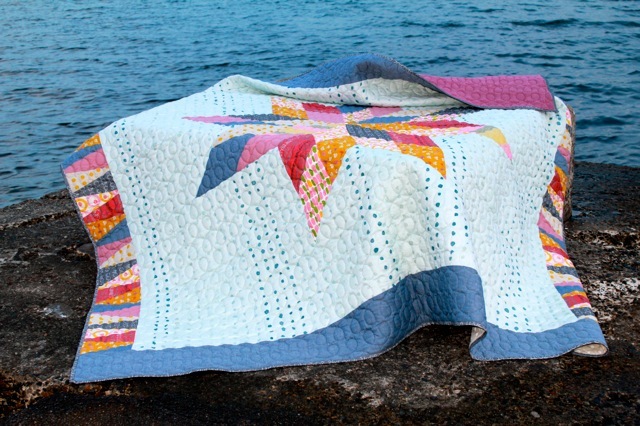 Maggie and Sparrow - An Australian quilt maker with a gorgeous sense of colour. Her colour palates are so interesting to me. They are harmonius and very very calm. But she uses colourways I just wouldn’t think of. Again another person that gets colour. 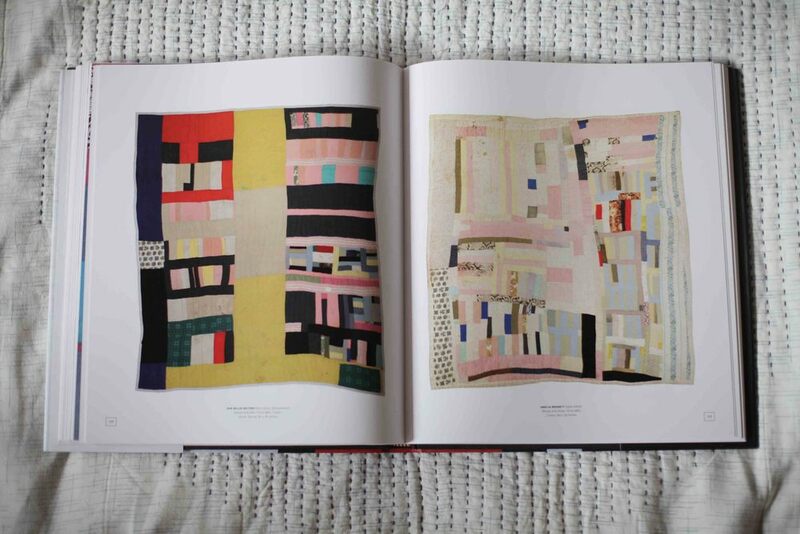 Lotta Jansdotter's quilt from one of her earlier books. And have a look at this one by Insung from Namoo here. And with that I have to get to bed. I think I've mentioned it on each patchwork post but just in case I haven't - if any of these lovely quilts have inspired you to give patchwork a try then please join us at The Craft Sessions this year. The lovely Melissa of Tiny Happy fame is teaching Freedom Patchwork which will have you capable, confident and joyful by the end of the day. Part 1 - I was totally wrong about patchwork! Quilt by Meg Callahan. Photo courtesy of Meg Callahan. I'm often wrong. Which I love. I love the fact that there is always more to learn and that I don't already know everything. And that sometimes things I have believed wholeheartedly turn out to be complete piffle. And that sometimes you have to learn things slowly, rather than just being taught. And so today, because all those statements are true, I want to say that I was wrong about patchwork. Totally wrong. But back to where I started. I thought patchwork was way too busy and too bright and messy and loud. It just seemed too much. And then on top of that I really hated the idea of taking a beautiful print and chopping it into little pieces. That didn't make sense to me. And that is not to say that I didn’t see the a quilt here and there that I liked, but for the most part I thought they weren’t for me. That said, I liked quilts – their function and the feeling of them. We sleep under one in the summer rather than a doona. I even made a few – wholecloth quilts of course - where I didn’t need to snip up the pretty pretty fabric. And I also think there was also some kind of avoidance of patchwork hidden in my dislike, in that I was also a bit scared of trying it. It seemed like a different science to making a frock. One where colour choice was oh-so-important. The same quilt pattern can look so vastly different – stunning or super-ugly based on this simple but complicated thing called colour and fabric selection. Learning how to do that felt a little bit impossible. And then it happened - slowly but surely I was shown the error of my ways. About two or three years ago quilts started popping up on the web and pinterest that I didn’t just like - I LOVED! And they were sometimes quilts where pretty fabric was chopped up, and still I loved them. And then I started seeing people who were making quilt making into an artform with their incredible talents in composition and form, and their deep understanding of colour. And I really did fall in love. So I thought that today I would share some of my favourite quilt makers - the ones that have made me fall in love. Then in the next post, I'll tell you a little bit about what I think they have in common that makes their quilts oh-so-special. First up there was Denyse Schmidt. For those of you who haven't heard of her she is a quilting pioneer and really the first person whose quilts spoke to me. 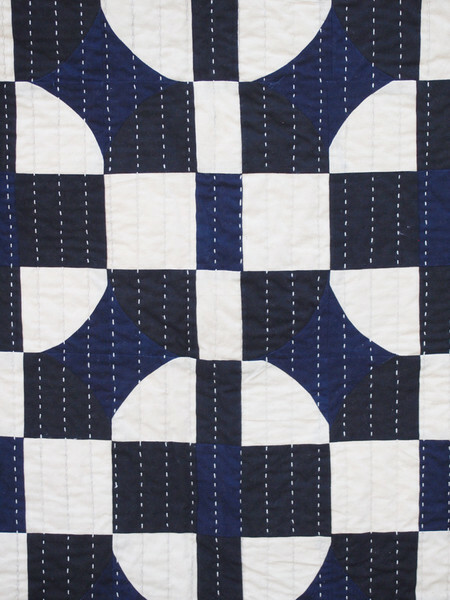 I first saw her work about five or six years ago and I loved her Sonic Blue/Deep Blue quilt. A bit improv-ish, still simple but stunning. (There is also the Tangerine version). Pretty fabric was cut up but I wasn’t forced to shield my eyes from the busyness. I can picture this quilt in my mind so easily as I have looked at it so many times. And then she did a range of quilts called the Mount Lebanon series. Go and have a look at them. They are really beautiful and even more quiet. And at the time I hadn't seen anything like them. My dislike shifted a little, and I purchased a couple of quilting books - the super one from Purl Soho and both books by the incredible Denyse. And there were some beautiful things. Things that I felt could be adapted to my taste. I started to see the potential. And I started pinning things on Pinterest. And slowly, but surely have built a whole board of quilts I love. So then, about two years ago, I came accross Maura Grace of Folk Fibers. Wow. I fell so hard and so deep - as did the rest of the world. I think it was the Colorado Quilt (shown below in reds and pinks) initially and then the Georgia (dark one) and then the Idaho (yellow). Totally different quilts but all with something totally interesting and stunning about them. Maura uses naturally dyed fabrics, machine piecing and then hand quilting producing these amazingly tactile looking quilts. I adore the yellow Idaho one so much I think I dream about it. And at the time Maura was blogging a little more, and I had just joined instagram where she documents her process. Maura has made one amazing quilt after another for years now - developing her style and her techniques over that time. It has been truly amazing to watch. And through watching I became a little obsessed with learning more processes. I had to learn how to do a sashiko type stitch on a quilt. I made a wholecloth quilt or two for my small girl in order to teach myself how. And then progressed on to my imperfect quilt which I loved making almost as much as I love it finished. It was definitely a process as well product thing for me. Sawtooth quilt. Photo courtesy of Maura Grace Ambrose. Flying Geese Quilt. Photo courtesy of Maura Grace Ambrose. Making a few quilts and planning many more has meant that I have become even more curious about other makers. So in the last few months I have gone out looking for more. I have been looking for people who make quilts that I love, so that I can analyse them to figure out why I love them so much. What is it about them that speaks to me - and once I understand that - what it is that I want to make. It is all part of my visual diary process for quilts. I'm going to show you a few bits and pieces from my three latest loves in no particular order, but please follow the links and have a look at their work. There is so much more to their work than I am able to show in one post. Hopewell Workshop – wow! They have been popping up all over the interwebs. Claire and Eliza really understand simple composition, colour and form. The simplicity of those three things in their quilts really make my heart sing. I adore their use of simple prints mixed with plain fabrics, and simple arrangements. Unlike many of the other quilt makers they aren’t solely making one-of-a-kind pieces and the quilting is done on a machine. Which makes their quilts more accessible. They are true masters of fabric choice. Tell Tale East - Photo courtesy of Hopewell. Lavender Horses - Photo courtesy of Hopewell. Pink Little Courthouse - Photo courtesy of Hopewell. I first came across Lindsay Stead on pinterest. The amazing quilt below right won First Place in the Minimalist Design Category at QuiltCon 2013. And was all over the place. But it was only after finding her through instagram and then her website that I realised how amazing she is as this quilt as not a one off. She is a master of mixing up a traditional pattern in new ways. The one below left won the Judge's Choice Award in the same year. The two quilts towards the start of the post are also hers. Her latest series of quilts explores scale - enlarging quilt blocks to full quilt size. I love these. And finally Meg Callahan - the quilter about whom I know the least but again I found via pinterest. I didn't even realise the quilts I was pinning were the same person until I went through the wormhole and found her website. I actually didn't realise initially that they were quilts. I thought they were blankets that were printed. Again I was wrong ;). And wow! Her patterns aren't traditional. They are more detailed than a common traditional quilt pattern and more geometric. And they are unlike anything I have seen before. I mean c'mon. Look at those things. I could have added a heap more of Meg's quilts but this is already a photo heavy post. Go and have a look at her site. So next post I'll tell you about the things I have learned about why these quilts are so special - other than just their genius. I've looked at them a lot and they have some things in common that we can all learn from. I'll also give you a bit of a list of other wonderful work I've seen you might want to check out. If this post has sparked your interest in what patchwork might do for you, you might consider joining Melissa Wastney at our Freedom Patchwork course in September. She will be teaching a day of patchwork exploration, where you will come out with the skills you need to start making for yourself. Imagine the possibilities. If you have other people that you think I should look at please leave them in the comments. I am hungry for more. Or maybe you just want to tell me about things that influence your quilting and patchwork. I'd love to hear. Part 2 and Part 3 of this post are now up on the blog.